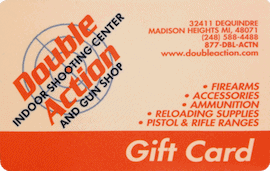 Double Action Indoor Shooting Center & Gun Shop is a third generation, family owned Michigan business that treats their customers like family. Al Allen, the owner, believes that buying a gun is a very personal experience. “This is a people business”, says Allen. Customers who bought their gun from me have returned years later to buy their child their first gun. That’s very important to me and an honor to be able to share in that special moment in my customer’s life. And many times that same ‘child’ (now an adult) returns with their son or daughter, for their first gun. That tells me we’re doing something right”. Whether you are looking to buy a gun, take a few lessons, or load up on supplies, you will not find a nicer group of knowledgeable people ready to help you. Contact them today or drop in to see them, you’ll be glad you did! When you first enter Double Action’s store, you’ll be blown away with their wide selection of merchandise and if you’ve been to any other gun stores, you’ll agree that there isn’t another gun shop stocked as well. While having a large selection of inventory is important to Mr. Allen, he also believes that it is equally important for you the customer, to be able to shoot a gun before you buy. “I don’t want my customers to ‘buy blind’. If you can test drive a car, why not test drive a gun on our range before you buy”? That’s been Al’s business philosophy since he first opened Double Action Indoor Shooting Center & Gun Shop on Dequindre Road in Madison Heights, Michigan.